If a proposed trail linking Santa Rosa with Sonoma is completed, bicyclists and pedestrians will be able to travel through the scenic Valley of the Moon at a safe distance from automobile traffic on Highway 12. But don't clip in those shoes too readily—it's a long and winding road from plan to reality. And as yet, there's no plan. Between Santa Rosa and Glen Ellen, Sonoma Highway is the only available route for cars, bicycles and the occasional dogged pedestrian alike. Constant, fast-moving traffic and long stretches with little or no shoulder presents cyclists with a teeth-gritting experience at best until the fork at Arnold Drive. "Right now, you've only got two options," says Gary Helfrich, executive director of the Sonoma County Bicycle Coalition. "Arnold is safer—but which is safer, cave diving or bungee jumping?" Last September, Sonoma County Regional Parks was awarded a $190,575 grant from Caltrans to conduct a study whose conclusions, bicycle advocates hope, will result in the construction of a 13-mile paved path linking Agua Caliente to Santa Rosa. A study of the segment linking the existing 1.5-mile Sonoma Bike Path to Agua Caliente Road was completed in 2001. It's tempting to already envision the path as it starts at Melita Road east of Santa Rosa, breezes past Oakmont and the contentious Annadel State Park access, and wends through wine country. The trip would take about an hour at a moderate pace. Unlike the Joe Rodota Trail connecting Santa Rosa to Sebastopol, however, the Sonoma Valley bike path is not expected to be a straight shot on an old railroad right-of-way, despite tantalizing vestiges of the abandoned Southern Pacific line. Instead, it's expected to be mostly built above an aqueduct, on an easement that is held by the Sonoma County Water Agency. That doesn't mean that the project is shovel-ready, according to Ken Tam, a park planner with Sonoma County Regional Parks. "First things first," he says, "we've got to see if this thing is feasible." Landowners may have built structures on the easement or planted an extra row of grapevines. "Let's say there's not enough right-of-way out there, or the property owners are not interested in selling," Tam hypothesizes. "We wouldn't be able to do it." Having only recently left a meeting in which he'd been updated on the plan, Cordel Stillman, deputy chief engineer at the Sonoma County Water Agency, says that while he personally thinks the area could benefit from a cycling route, he is also cautious about the details. "There is an aqueduct that basically parallels Highway 12 for quite a ways," he offers, "and then takes off and goes cross-country." The easement only gives the water agency the right to maintain pipes that are in the ground. "It says absolutely nothing about bike paths or access. The fact that we have an easement does not make it any easier to get a bike path in there," Stillman says. Meanwhile, we're not likely to hear much more from planners about the proposed route, partly because when it becomes known that a municipality is prepared to pay for a transportation project right-of-way, speculators may bid up affected parcels. Representatives from several wineries along the route declined to comment until more is known. But tourism via bicycle is already part of the scene at St. Francis Winery, according to the winery's director of consumer sales and marketing Aura Bland—the winery even offers cycling jerseys emblazoned with its logo. 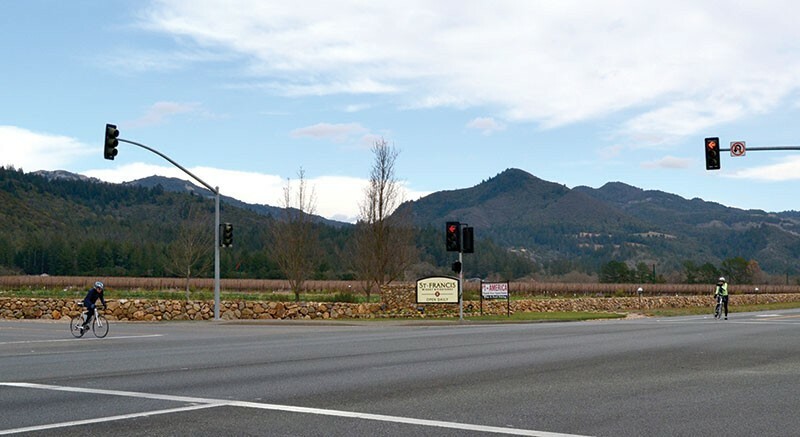 One aspect that may help the Sonoma Valley plan, as compared to similar plans, is that many of the potentially affected landowners are wineries and others businesses that are more likely to view increased access by recreational cyclists as beneficial. Although the study, which will include community meetings and public workshops, won't be completed until the end of 2015, Helfrich says getting the grant in the first place was probably the hardest part. Funding for construction should be comparatively easy. Still, for cyclists eager to zip freely through the vineyards without worrying about car traffic, it may seem like a frustratingly long time to have to wait. But Helfrich is confident that it'll be worth it. "It's going to be one of the best trails in the Bay Area when it's done," he says. "It's going to be great."